I said on Tuesday that I wanted to save today for some cheerier news. That news is that I’ve finished the revisions to Like Herding Cats. Actually, to be totally honest, I haven’t quite finished. I’ve got one chapter to go, so–barring a total computer meltdown*–I will finish today. * I really, really hope I didn’t just jinx myself…But what are the odds of four different computers dropping dead at the same time? No, don’t answer that; I’m happier not knowing. Finishing the book doesn’t mean you’ll be able to read it soon, unfortunately. As I’ve said before, publishing is a glacially-slow business. Let me run through the next steps for anyone who’s curious. 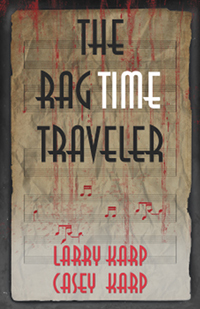 I’m still not interested in self-publishing. That means I’m looking for a so-called “traditional publisher”. Some of you may be wondering “What about Poisoned Pen?” Well, see, PPP is a mystery publisher. LHC isn’t a mystery. So, even if PPP wanted to publish everything I wrote, they wouldn’t be a good fit in this case. Publishing isn’t just about printing the physical book and formatting the ebook. Just to give one example, publicity and marketing (two different things, though there is some overlap) require genre-specific knowledge, and PPP doesn’t have that knowledge for the sort of fantasy I write. While some publishers, especially smaller presses, will accept submissions directly from authors, many require–or at least strongly prefer–agented submissions. So I need an agent. Finding an agent is like getting an acting job. You have to audition. A lot. Agents get literally hundreds of applications (“queries”) every week. How many are they likely to accept? Depends who you ask, but I’d be surprised if the average was as high as a dozen a year. Why so few? It’s not because they’re looking for a surefire bestseller. There isn’t such a critter. They’re looking for a book they think they can sell. Or, in many cases, they’re looking for an author they think they can sell. Because they don’t want to just sell one book, they want to sell lots of books. A good author/agent relationship lasts a lifetime. Which means agents are justifiably picky. And authors have to sell their books multiple times. First with a query letter that introduces the book and the author. It needs to make the book sound appealing enough for the agent to look at the first few pages. Those first few pages need to be interesting enough for the agent to ask the writer for more–sometimes the whole book, sometimes just a larger sample. This is not a speedy process. A good agent is going to prioritize their current clients over prospective ones, so their query reading time is limited. Most agents need a month or more to respond, and then, if they’ve requested more of the book, they’ll need more months to read that. That’s grossly undersimplified, but you get the idea. In the best of all possible worlds, LHC might take six months to find me an agent*. In a not-so-good world, it could be a year to eighteen months. * In the worst of all possible worlds, it won’t find an agent at all. Splat Squad didn’t, and neither did Lord Peter. If one of them had, I wouldn’t be sending LHC out looking. But let’s be optimistic. I find an agent, and then I can look forward to LHC hitting the shelves, right? And then the agent has to sell the book to a publisher. You probably won’t be surprised to hear that process takes time. After all, it’s very much like querying an agent. So now we’re a year out–end of 2019–but we’ve got a book deal. Surprise! We’re still not close to publication. The publisher is going to want a round of revisions. No book is perfect, right? Right. And the publication process takes time as well. Contracts are being signed right now for books to be published in late 2020. Sure, PPP did it a lot faster with TRTT. There were reasons to accelerate the process, reasons that wouldn’t apply to LHC. Bottom line, if everything breaks perfectly, you’ll be getting a copy of LHC for Christmas in 2021. And by that time, I should have three or more additional books going through the sell/revise/publish process. The old saying is “You can’t win if you don’t play the game.” I’m playing the game. Finishing the book and sending it out on query is a win. Small, perhaps, but any victory is cheery. With just a tiny bit of luck, this will be the last Short Attention Span Theater for a while. Barring unexpected events, Like Herding Cats will go out to the beta readers this week and I’ll be able to stop stripping my mental transmission by jumping back and forth among writing, re-writing, and copy-editing. Which brings me to the first production on today’s program. I could use another beta reader. Now, before you immediately deluge me in requests, let me remind you what beta reading is and is not. I don’t expect every reader to answer every question, but these are the things I need to know to make the book better, so the more you can answer–and especially, the more faults you find–the happier I’ll be. I want beta readers to find the problems, not agents and editors! Still interested? There’s one more qualification: you must be familiar with modern urban fantasy, by which I mean you’ve read several works in the field which were published within the past five years. “Several” means “more than one, and by more than one author”. If you’re still interested, drop me an email. Do NOT apply via a comment on the post, by Facebook Messenger, or by Twitter reply. Thank you. And, speaking of jobs, I got a weird offer in email recently. We bought our car from a dealership, and we take it in for maintenance every six months. They’ve got my email address because I like getting a reminder that it’s time for the next visit and because they send out occasional special offers. Yeah, imagine that, advertising done right: opt-in. So then I got this latest note from them. “Join our team!” says the subject line. Uh-huh. Job listings. And not just sales positions. They’re looking for a mechanic and for a person to check cars in and out of the service department. Apparently they consider recruiting to be a type of advertising. The email has their boilerplate at the bottom reminding me that I opted-in to receive occasional ads. There’s a place for everything–and that’s not the place for job postings. Next time I take the car for maintenance, I’ll ask how many job applicants the email generated–and firmly request they remove my name from that list. It appears our cats know there’s a place for everything. And once in a while, they take a vacation from playing “Gravity’s Little Helper” to put things in the right place. We’ve taught them that fish comes in cans. So yes, that’s the current incarnation of Mr. Mousiefish, carefully place in a gooshy fud can–presumably so he can be eaten later. I can’t decide if this is so meta it’s hilarious or so cliché it’s painful. Though I lean toward the latter. Joe, ya shouldn’ta oughta done it. We’re not planning to give out any candy this year–although we do have a couple of emergency bags in case someone shows up despite our best efforts to look like we’re not home. There’s no particular reason we’re being anti-social, just a general lack of holiday spirit. It’s not that I don’t know why it was a good idea. I just don’t want to have to read and transcribe half a page of my scribbles. And so I defer it to Draft 3, which gets done on the computer. The downside is that it’s kind of like freeway driving at rush hour in a car with a manual transmission. Cruising along at twenty mph, transcribing the Draft 2 changes. Come to a complete halt while I check my notes–was it robin’s egg blue or sapphire blue–and then creep along at ten mph while I write the scene. And then get off two exits down the road and circle back because I just came up with a great line that has to go into the new scene. Anyway, distraction. So you get a bit of a Short Attention Span Theater for Halloween. 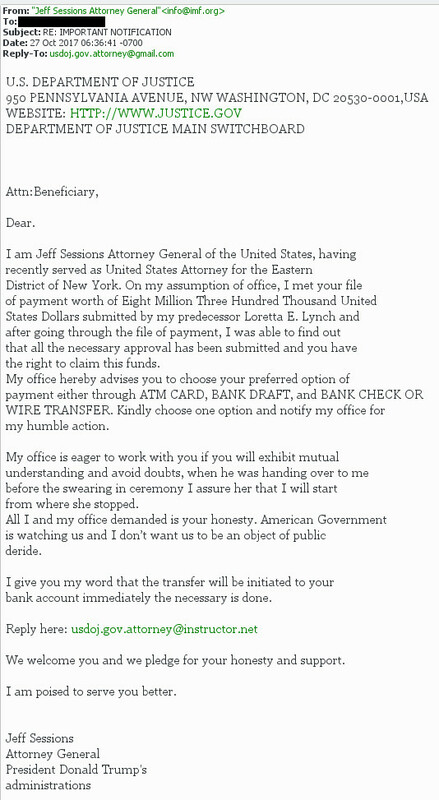 Am I the only person out there who got a scam spam of the 419 type from “Jeff Sessions Attorney General” recently? I know the Trump administration is, shall we say, a trifle challenged, ethically-speaking. But really, Jeff, there are faster, easier, and–dare I say it–even legaler methods to separate fools from their money. Now, you may say it’s probably not Mr. Sessions sending out these letters, and you’re probably right. Perhaps it’s some flunky in the Justice Department trying to curry favor–or line his pockets at the boss’ expense. Now ask yourself: who in the current administration is well-known for cranking out dozens of grammatically-suspect, logic-deficient electronic missives in the middle of the night? Donald, put down your phone and go play golf. A sneak peek at Thursday’s final summation of how I did in predicting the playoffs: I got one of the two World Series teams right. Go, me! As others have pointed out, it’s far too soon to anoint this the Best! World! Series! Ever! But it’s not too early to say it’s been a great one so far. Close games, mostly not decided until the final inning. Lots of home runs, some interesting strategic decisions to argue about, and a fascinating sideshow in the Yuli Gurriel and Bruce Maxwell stories. We’re getting Game Six tonight and, if the Dodgers do us a solid, Game Seven tomorrow. I don’t know about you, but I’m having so much fun with this series, I don’t think even seven games will be enough. I’m hereby petitioning Commissioner Manfred to extend the World Series to twenty-three games. If we alternate two games in each city with a travel day in between, that’ll wrap it up with Game Twenty-Three on November 24, the day after Thanksgiving. Let’s not forget that Los Angeles and Houston are warm weather cities. No worries about games getting snowed out. And really, isn’t twelve a much more satisfying number than four? And the best part: consider the advertising tie-ins! Everyone can watch that climactic Game Twenty-Seven on the new TV they picked up that morning in a Black Friday sale. What do you say? Who’s with me?